The bargain basement pricing on these fine range rounds makes them an easy choice for 6-gun shooters. 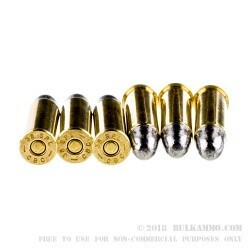 The all lead projectile is about as plain vanilla as you can get for your .38 special, with a large 158 grain bullet and a substantial powder charge. 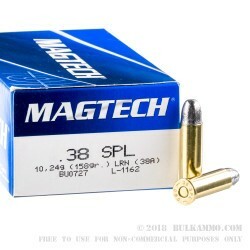 Some shooters note that it has a bit of a dirty powder charge but relative to most of what you could be shooting at this price point, the Magtech .38 special is quite clean comparatively. It does have an exposed lead projectile so handling is a bit dirtier and if your revolver is old or not tuned you might notice a bit more debris, but generally speaking it’s pretty legitimate ammunition for punching holes in targets. The price cannot be beat, and the reliability is seriously high, so in all, it really does make a lot of sense to consider this load. It moves out of the barrel at 755 feet per second and has around 200 ft. lbs. of energy at the muzzle making it a good range round that shoots easy. 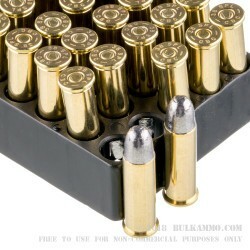 Similarly, the performance is more akin to range ammo, than it is for self-defense, it’s excellent training ammunition. 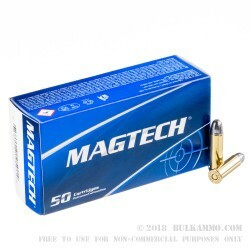 A: Hello Joey, This Magtech ammunition is loaded in reloadable, boxer primed brass. Q: What is the FPS speed on this ammo? A: Hello Buz! The muzzle velocity on this Magtech .38 special ammunition is 755 fps with a muzzle energy of 200 ft. lbs.